Oh The Joy of Fishing! It was just another day and I decided to load the kayak and head to the Bourbeuse. We had heavy rains the night before and that morning. After finally getting everything together I headed for the river with visions of fish dancing in my head. The sun was shining and the river was up. but dropping. The current was running wild and you could see where it had been out of its banks just a few days prior to my fishing excursion. I had my doubts about there being any good fishing in my future but there is no bad day of fishing, so I thought. I started down river and had the thought of setting some limb lines but the nasty current would soon change my mind. So I headed up river to a point where the water was shallow and dumped into a deeper hole. It was swirling around a sandbar then rolled into a deeper hole where bait fish would be pushed into the deeper water by the current. I backed my yak into the sandbar and decided to fish the hole. I started with heavy pole and line and it wasn’t long before something started nobbling on the bait. Have you ever had the opportunity to go to combat with a bait stealer? It can be very frustrating and you develop an attitude that you aren’t giving up till you hook the little nuisance. Well that is what happened. It kept stripping the hook so it was time for plan B. I pulled the ultra light out of my arsenal rigged with a pan fish hook and slip sinker. Well plan B didn’t work and I guess it gave up or was full after its fine dinner of Canadian night crawlers. As time passed I was listening to the chirp of the crickets and croaking of the frogs and enjoying the flashing of the lightning bugs to the point of forgetting about the line in the water. Then it happened. Wham! something was dragging the ultra light across the deck of the yak. It woke me out of my trance and somehow I managed to take control of the pole. I set the hook and hot damn the fight was on. It started south so I thinks to myself it has to be a channel. Wrong again! About that time the fish does a tail walk on top of the water dives and comes back up and does another tail walk. By this time I think, oh my gosh, I have hung a bass. It starts peeling off line and I realize that it might be a little too much for my ultra light pole with 4 pound test line. We go head to head for about 5 minutes and I feel the yak being pulled off the sand bar and into the water where the current was waiting to push the yak down the river. Oh crap what now? I manage to hold the rod with my knees and grab the paddle and start fighting for position. This stuff is hard on an old man I tells ya. I manage to get him started to the boat and get up alongside the yak and got him close enough to realize that he was big enough that I could put my whole fist in its mouth. Then it happens! NEWS FLASH! Hey dummy the dip net is behind you so how in the hell are you going to get to it. I make a management decision to hoist him into the yak and everything is going perfectly then BAM! He gets himself unhooked and lands on the deck of the yak and starts flouncing about like I had put him into a hot frying pan. He is flopping and I am trying furiously to get ahold of him then, then, then SPLASH! Yep sure enough as he hit the water he was singing Born Free. I practice catch and release however that wasn’t what I had in mind at the moment. Pictures! I wanted pictures but I guess he was afraid the camera would steal his soul! That is my story and I am sticking to it! All in all it was a good day on the river. 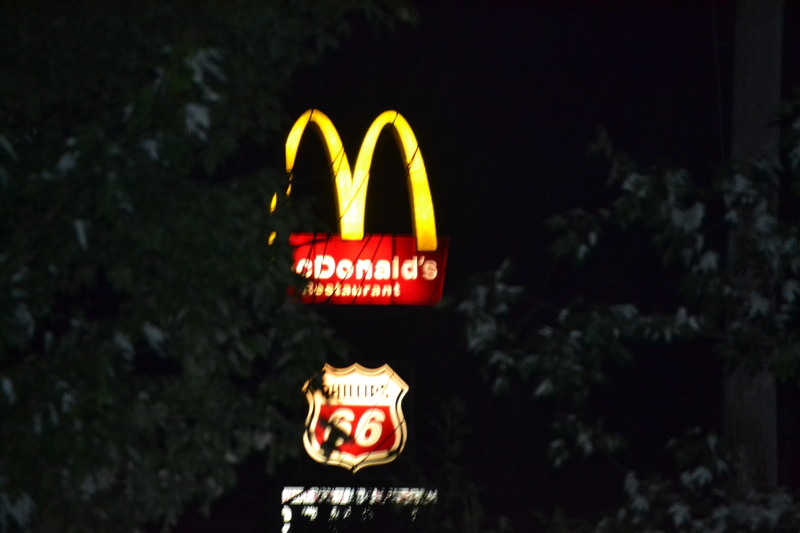 I thought it was only fitting to take a picture of the MacDonald’s golden arches because that was the only place I would be getting a fish fillet sandwich. Thanks for reading and I hoped you enjoyed it. Nothing seemed to go right today but I am sure there is one fish in the Bourbeuse that is glad it didn’t. Aww the joys of fishing. ← Farrriers Are Independantly Wealthy! NOT!